How much tea can one pour from a pot without refilling it? No matter the capacity of the container, sooner or later it will empty of it is not replenished. The same can be said of the compassion of women. As wives, mothers, friends and community members women often work selflessly and tirelessly to meet the needs of others while neglecting their own need to be nurtured. Ellen Michaud has focused her life on celebrating and supporting strong women who support others. 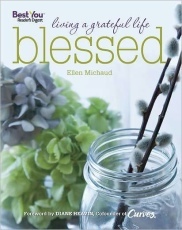 Her latest book, Blessed: Living a Grateful Life, Michaud invites her readers to explore and enjoy the everyday blessings that surround us. Replenishing our own reservoirs of strength needn’t take weeks or days or even hours. A few moments spent here and there truly noticing and appreciating our family, friends, community, and environment can fulfill us in ways no vacation ever can. Each chapter in Blessed is a story unto itself complete with refreshment for our souls and lessons on embracing our blessings. Each reading is a two to three page vacation from our own daily stress. I have enjoyed these readings every morning either with or in place of my daily devotional. Sometimes we just need to stop for a moment and absorb the quiet moments in the world around us–to take a deep breath and appreciate the things in life that make us thankful and bring us joy. In this heartfelt collection of her online columns from Diane, the flagship magazine of the Curves women’s fitness center organization, author Ellen Michaud reminds us of the everyday blessings that surround us, but we all tend to overlook. The Teapot: During a snowy winter storm, the author pulls her great- grandmother’s worn silver teapot down from a shelf. As she polishes the teapot’s tarnished surface, she contemplates its long journey over an ocean and through the generations. As she discovers engraved hallmarks that lead to a deeper understanding of its 200-year history, her appreciation for the women who traveled with it grows. 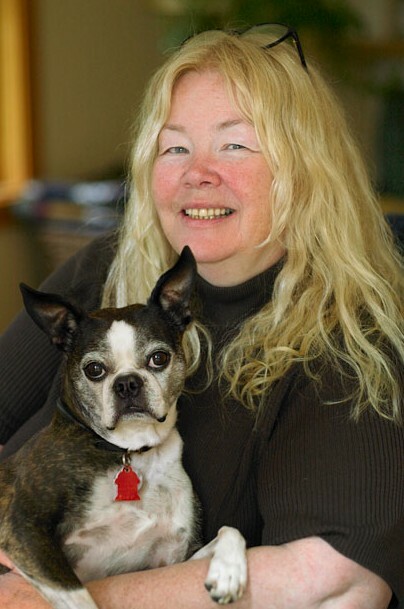 Ellen Michaud is an award-winning author and editor who lives high in the mountains of Vermont. Her work focuses on women’s stories, and has appeared in the New York Times, Washington Post, Ladies Home Journal, Health Magazine, Better Homes and Gardens, Parents Magazine, Men’s Health, Readers’ Digest Magazine, and Prevention Magazine, where she was the editor-at-large for six years. Today she not only writes for these and other media, she is also an online columnist at MyCurves.com. That sounds like an awesome book! Thanks for sharing it! Just another reason to miss being a member of Curves…sigh. The only one near me closed less than a year after I joined. I will most assuredly buy this book. Sounds like an uplifting book! This sounds wonderfully inspiring. I’ve been trying to see the world as if I was a toddler lately, looking at how fascinating the everyday can be. I am finding it relaxing in odd moments but it is very challenging.